The overall look of the ground has greatly improved with the re-development of both ends of the ground. 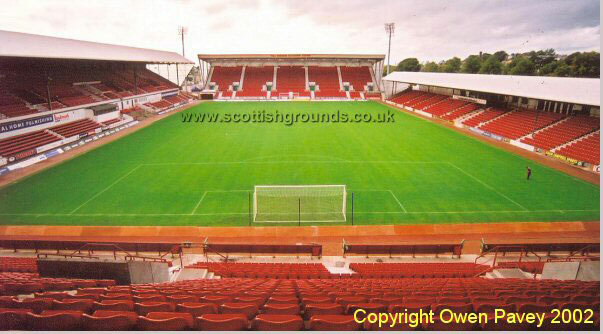 The Norrie McCathie & East Stands at each end of the ground, are very similar in design and were opened in 1998. Both are covered single tiered stands, that are quite steep in appearance. On one side of the ground is the two tiered South (Main) Stand, which is a classic looking football stand built in the early 1960's and is of a good size. On the other side is the smaller North Stand, which is single tiered and covered. After the Club accepted a grant from UEFA to replace their grass surface with a new experimental artificial pitch, which was installed for the 2003/04 season, the Club have now reverted back to grass at the request of other SPL members. Reaction to the artificial pitch experiment were mixed, especially when visiting sides lost on it! Away fans are normally housed in the East Stand at one end of the ground, where just over 3,000 fans can be accommodated. The facilities in this stand are good and the view of the playing action excellent. If demand requires it, then parts of the North & South (Main) Stand can also be allocated for a total of 6,783, which is the allocation for Old Firm games. Other visitors get a maximum of 4,400 seats. There is normally a good atmosphere generated within the ground. One point of interest is that the winner of the half time lottery is presented with the relevant amount of cash on the pitch. Lets just hope that they don't get mugged on the way home! Jim Francis recommends the Elizabethan for away supporters to drink in. Otherwise the ground is around 10-15 minutes walk away from the town centre where there are plenty of pubs to be found. Leave the M90 at Junction 3. Take the A907 towards Dunfermline. Just keep going straight on this road and you will eventually come to the ground on your right. From the A985 take the A994 towards Dunfermline. Keep straight on this road into Dunfermline and you will come to the ground on your left. There is an official car park at the ground (�1) behind the East Stand. Otherwise street parking. There are two stations that are each about a 15 minute walk away from the ground, or about �4 in a taxi. These are Dunfermline Queen Margaret & Dunfermline Town. Both are served by trains from Edinburgh and the latter as the name suggests is closer to the town centre. Concessions apply to OAP's & Under 18's in all areas. In addition in the home sections, then the unemployed and the disabled can also qualify for the concessionary rate as long as the ticket is bought in advance. For the Dunfermline fixture list click here (to take you to the BBC Sports Website). There are 12 wheelchair spaces made available to away supporters in the East Stand. If you require hotel accommodation in the area then first try a hotel booking service provided by Football Hotels who are powered by Activehotels, who specialise in locating accommodation near or within a short travelling distance of the football ground. They also have the added advantage over some other hotel booking services that you pay on departure. Yes this site will earn a small commission if you book through them, but it will go to help with the running costs of keeping the Guide going. To access their Dunfermline page click here.